Product #17321 | SKU SAMETEORITE | 0.0 (no ratings yet) Thanks for your rating! 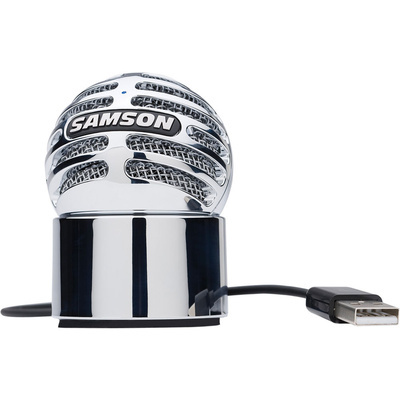 The Samson Meteorite is USB condenser microphone that features a 14mm diaphragm, a flat frequency response and 16-bit, 44.1/48kHz resolution. This compact desktop mic gives you professional sounding audio in a portable design. The Meteorite also features a removable magnetic base that allows for a full range of motion for optimal positioning when recording podcasts, interviews, demos and more. Also, the mic can be directly connected to any computer via its integrated USB cable, and it is compatible with most computer-based digital audio software. In addition to Mac and PC, the Meteorite is also compatible with the iPad when combined with Apple's Lightning USB Camera Adapter or Camera Connection Kit (30-pin).